Welcome to the Star Ocean patch! 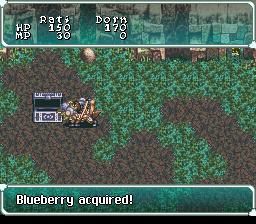 One of the most-delayed and most-desired translations for SNES is finally finished! 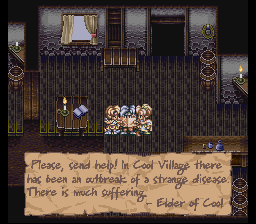 Just about every bit of Japanese we could find in the game has been translated to English and gone over with a fine-toothed comb. The only things not translated are the Japanese voices. A project for dubbing these voices is in the planning stage, so stay tuned! • If you have savestates from an earlier version of the patch, or the Japanese version, those savestates WILL NOT WORK with this new patch. The best thing to do is save normally using the in-game save function. This information is constant among versions and will allow you to play the game normally regardless of which version you use. • We tried getting rid of the Japanese subtitles in the intro (the dialogue's in English anyway), but some are still there. We're not planning on translating them since it's a pain and the people speak in English anyway. 8p If you can't make out what they're saying, check the Star Ocean Shrine walkthrough. • Only two colors can be displayed in the dialogue at any time. A very few places try displaying more than that and ends up looking a bit strange. • The techniques for Fear, Perisie, and Marvel don't have the yellow tech name in their description that the other characters' techniques have. • The ?Guard item has the same description as ?Item. • There are numerous bugs that are inherent in the game and have nothing to do with the patch itself (such as an item duplication bug, and various freezing or crashing bugs). 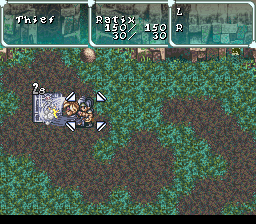 Check the Star Ocean Shrine for info on these bugs. • Because Star Ocean is such a huge game and has so many variations as far as party make-up goes, it's quite possible that there are bugs or bad translations we missed during beta testing. UPDATE: DeJap is long dead, as is their forum (http://board.zsnes.com/phpBB2/viewforum.php?f=16). If you find bugs please email them to me and I will post them here. • Add an 8x8 variable width font. • Add four-line descriptions in the menu (many descriptions had to be shortened to fit the three-line maximum). UPDATE: Again DeJap is long dead, it would be nice for someone to finish these. To everyone who donated money or hardware to the Star Ocean cause. As you can see, your contributions really saved the project! Thank you for believing in us! NOTE: if anyone has been incorrectly credited or is missing (i.e. you mailed in a donation and we didn't have a record) please let us know. Argh.. not enough time to finish everthing.. damn this game is evil. Dark Force will now be recuperating from Star Ocean-induced injuries. There's probably tons of stuff I could say about the Star Ocean translation project, but I'm too exhausted to go through it all, so I'll just say this. I can't believe it's finally (almost) done. I went through the script in like 2 weeks or so, so I was expecting the project to end very quickly. Instead it's taken 2 and a half years. What with real life issues, school, hardware problems, and everything else, I'm glad to see that the translation project is finally coming to a close. As I said, I translated the script in about 2 weeks' time, working about 8 - 10 hours a day during my summer break back in 2001. I then went to work on Bahamut Lagoon, and when I finished that, I came back and edited the 600 KB SO script. It was still too literal and translationesey so I edited it again. Literally, within 5 minutes of completing this 2nd edit, my hard drive completely failed. The hard drive recovery was semi-successful, but a huge chunk of the script had to be completely redone. Once this was done, my work with the project was pretty much over. Later on, I played demi's stunning Radical Dreamers translation and immediately felt that the SO script needed more oomph to it. But I was too busy with work to do anything for SO anymore, so luckily Cidolfas stepped in to spiff up the script a bit. And now here we are. Yay! I owe many thanks to everybody on MO's game translation message board. These guys helped me out in many a jam. There were some helpful people on the GameFAQs SO board at one point too, I believe. Also I owe thanks to a bunch of Japanese sites whose addresses I no longer have. They offered a lot of useful information when I needed context for stuff. But most of all, thanks go out to everyone who helped us get the data recovery stuff done. I actually found the accursed hard drive the other day when I was digging around in my closet. I have no idea why I still have it when it's nothing but a useless piece of junk, but oh well. MANY, MANY thanks go to Dark Force, I have no idea how he does the stuff he does, and the amount of time and effort he puts into his work is amazing. I can honestly say that most of his work is equal or superior to professional game re-programming work. Cidolfas also gets my thanks for picking up the ball when I found myself swamped in work. Akujin gets props for going through those list text files and translating and documenting everything so well. And thanks to everyone who's waited so patiently. Well, this was interesting. 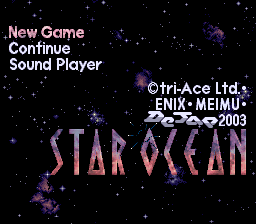 8-) After playing (and loving) both ToP and Star Ocean 2, I was of course enthralled with Star Ocean. However, at the time the only menu patch (by Chief Ug) was, I thought, woefully inefficient. I went so far as to teach myself basic ROM hacking and created my own menu patch based on his. With DeJap's beta patch, this rendered the game playable, though by no means beautiful. After volunteering my services to DeJap (and being rebuffed), I was contacted by Tomato and Dark Force almost a year later asking to be involved in the project. Naturally I said yes. 8-) Turns out I'd be spending the majority of two months in intense conversation (i.e. argument) with Dark Force about this patch. 8-) Nearly every technique and skill name and a whole bunch of items, enemies, terms, etc. were the subject of discussion by myself and DF. I can say I got my way about 40% of the time, which is pretty good. 8-) I know that some of you will be angry about how certain things were translated, but localizing something, not only in language but also culture, is an extremely challenging procedure. Something will always have to give. 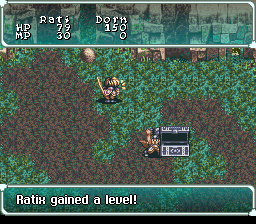 If we stay too close to the original (as Star Ocean 2 did) we risk sounding long-winded and robotic, not to mention confusing to many of our strictly North American audience. If we stray too far, we end up with something that isn't what the creators wanted. As an example, DF and I had a whole argument about the Sacred Beast techs. 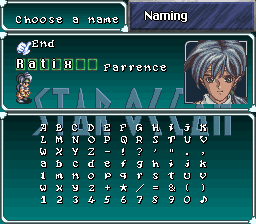 I wanted to use their Japanese names, and DF wanted to use the original Chinese names. We settled on English ones. 8p We also had to decide how close we wanted to be to the SO2 names. Many translations given in that game were just terrible. Generally, if the name was more or less correct we used it, but if it just sounded bad or was inaccurate or would never actually be used in the English language, we changed it (most notably is the change from Specialties to Abilities, since a specialty is really an area of expertise, not something you can use or do). Some item names (like Stone Check) were also changed because they didn't make a whole lot of sense. While technically we could work our way around the language to make them make sense, we decided that it would just be better to use a name that was actually meaningful. 8p In the end, I think we struck a very good balance with this patch, and I'm proud of it. 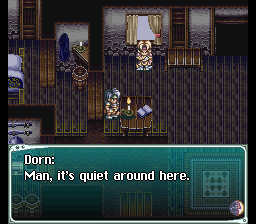 By the way, I also took the liberty of adding in a conversation in the bar in Ionis which explicitly discusses something that was sort of skipped over in the original script. (People who've previously played the game will know what I'm talking about.) However, I'm not 100% sure the conversation appears in all party configurations (I only tested it without any extra characters). We'll double-check this in future versions.